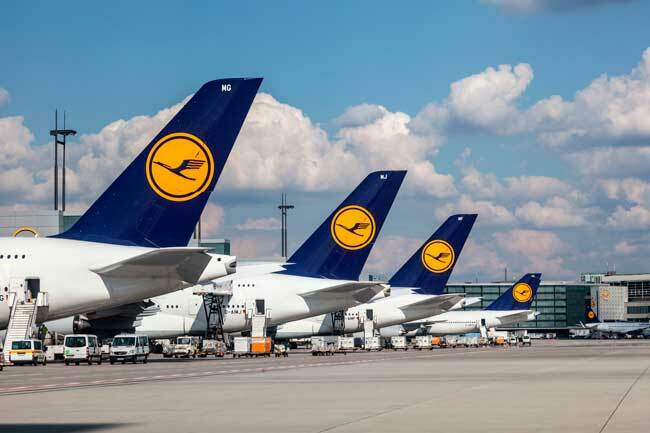 Use this website to quickly find the most important information about Frankfurt Airport: Flights, Departures, Arrivals, Parking, Car Rentals, Hotels near the airport and other information about Frankfurt Airport. 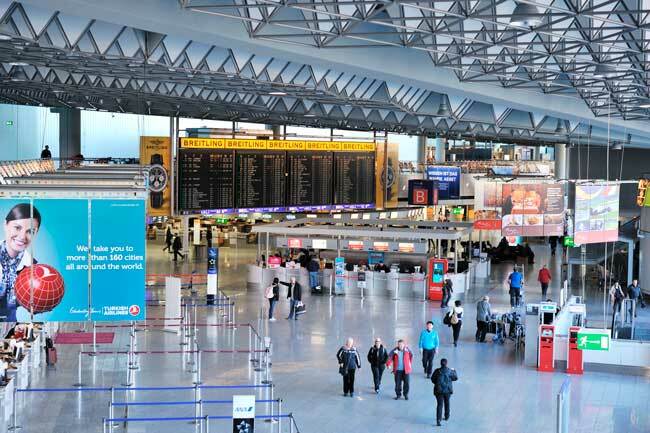 Plan your travel to FRA Airport with the information provided in this site. 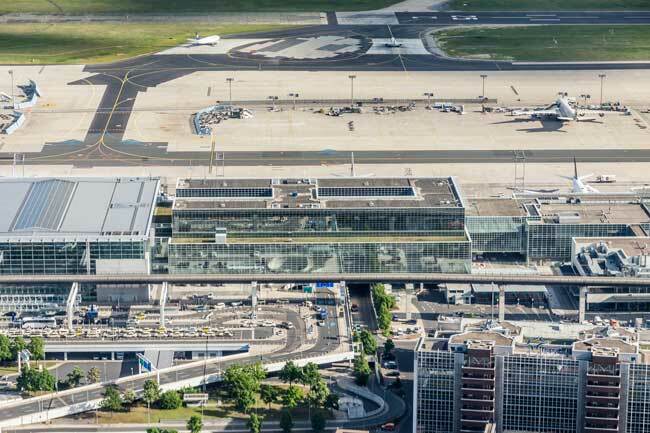 Frankfurt Airport (IATA: FRA, ICAO: EDDF), in German Flughafen Frankfurt am Main and also known as Rhein-Main-Flughafen, is a major international airport serving the city of Frankfurt, located at 12 km southwest of the city. It serves as the main hub for Lufthansa and Condor AeroLogic. Frankfurt Airport is by far the busiest airport in Germany and the 4th in Europe. Frankfurt Airport has two passenger terminals, 1 and 2. Also counts with an exclusive first class terminal owned by Lufthansa. Frankfurt Airport serves as the main hub for Lufthansa and Condor AeroLogic. 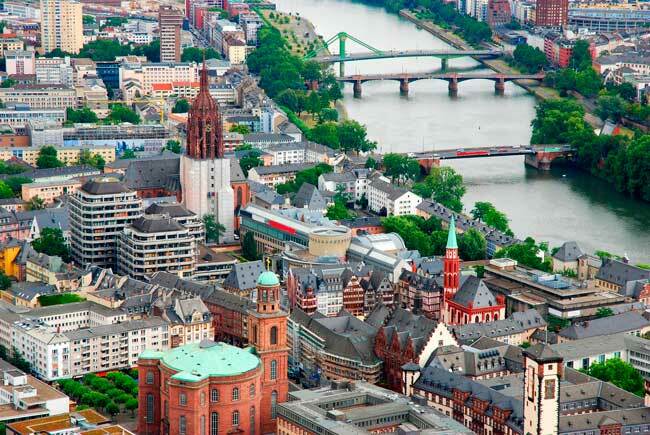 Frankfurt is the capital city of the state of Hesse and the fifth largest city in Germany. 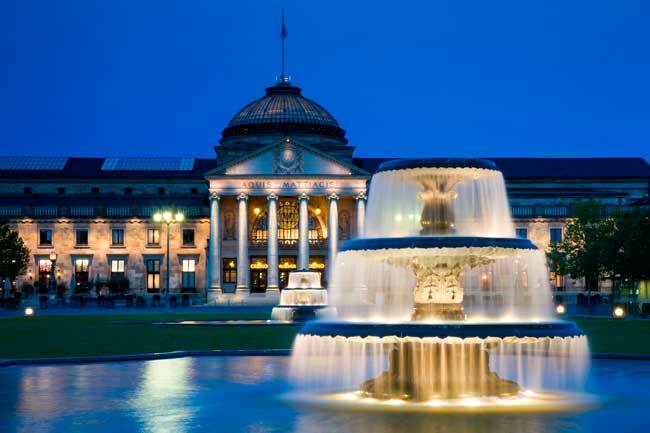 The Wiesbaden Kurhaus, located in the west, is one of the main attractions in Hesse state. You should visit the Frankenstein Castle. Top 10 destinations from Frankfurt Airport are Berlin, Hamburg, London, Zurich, Vienna, Munich, Madrid, Chicago, Paris and Singapore. Frankfurt Airport registered a total flow of 60,792,308 passengers in 2016. Terminal 1: Frankfurt Airport Terminal 1 is the oldest and largest terminal. Primarily used by Lufthansa, it hosts both international and domestic flights. It is a 4 level terminal. Terminal 2: Frankfurt Airport Terminal 2 hosts both international and domestic flights. The terminal is divided into 2 levels. Lufthansa First Class Terminal: This terminal is exclusive for first class passengers of Lufthansa. Only first class passengers of both Lufthansa and HON Circle are allowed to access. Bus: By taking bus line no.61. Train: By either S Bahn and U Bahn. Taxi: Get to Frankfurt downtown within 20 minutes. Car rental: Hire a car through our search engine or in the Car Rental Centre. Frankfurt, Frankfurt am Main in German, is the capital city of the state of Hesse and the fifth largest city in Germany with a total population of 731,095 inhabitants. The city also hosts a large number of fairs, including the Frankfurt Book Fair, which is the world’s largest book fair and one of the oldest fairs in Germany. Along all its history, Frankfurt highlighted for being a major city: It was one of the most important cities of the Holy Roman Empire, it became part of the Confederation of the Rhine as one of the major cities, in 1866 became the seat of the Bundestag, later on the seat of the first democratically elected German parliament, and after WWII became one of the most flourishing cities of Germany and Europe. It is one of the main touristic destinations of Germany. Regarding sights, most of them aren’t located within the city – they are 80 kilometres away. 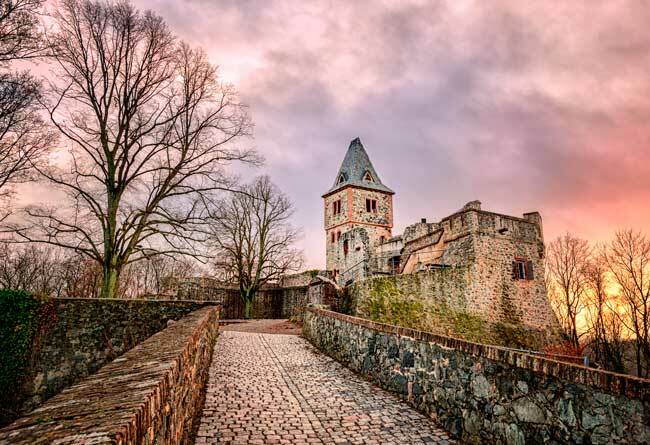 Some of this attractions are the Taunus mountain range, located in the north of Frankfurt, the Roman Empire Army Camp Saalburg, the Wiesbaden Kurhaus, located in the west, the Frankenstein Castle, the Vortex Garden and the college town of Heidelberg, all them located in the south. Frankfurt is a bike friendly city, counting with an extensive network of cycle routes. You can easily rent a bike by the Call a Bike service everywhere in the city, including railway stations. Also Nextbike sevice and Cycle Rickshaws are available.